Switch to the Shure Digital x2u XLR to USB interface to improve my audio. NosillaCast is now on Stitcher Radio at stitcher.com. Terry Austin of IntelligentElectrons.com teases us with a partial review of Voice Dream Reader which works with OCR apps to read documents to you in fabulous voices. Dr. Bott sent me a box of tech goodies and I started reviewing some of the products this week. I really liked the Skech Rise iPhone case and the Airframe Portable Car Mount, also available at Amazon. Kirschen Seah of FreeRangeCoder.com reviews the iOS Mail application Dispatch. Clarify 2 goes into public beta, get it at clarify-it.com and Clarify is in a cool bundle at paddle.com. In Chit Chat Across the Pond Bart takes us through Taming the Terminal Part 15 – Plumbing. Hi this is Allison Sheridan of the NosillaCast Mac Podcast, hosted at Podfeet.com, a technology geek podcast with an EVER so slight Macintosh bias. Today is Sunday February 2, 2014 and this is show number 456. Well Steve and I have done a couple more tweaks to my audio. I have been using using my Heil PR40 mic plugged into a Blue Icicle XLR to USB interface for ages, and like I mentioned last week it has a very finicky gain control knob. Steve suggested I swap with him and use his Shure Digital x2u XLR to USB interface instead. There’s a couple of advantages to the Shure. 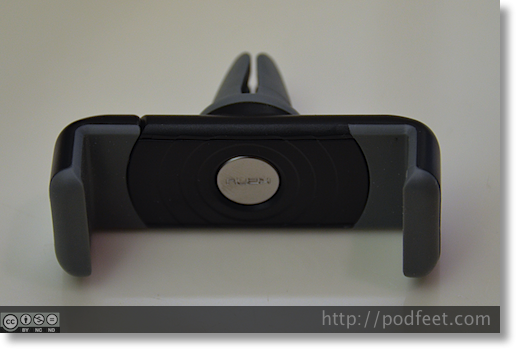 It has a much less finicky gain control slider, and it also has a monitor port. That means I can plug my headphones directly into the Shure interface and hear exactly what’s coming out of the mic. So if I’m peaking, I’m going to hear it. It also has a light that lights up green when I’m talking normally, changes to amber if I’m peaking and goes to red if I actually start clipping which is the worst sound of all, and for which there’s no recovery. I’m recording now with the Shure interface, and I did Chit Chat Across the Pond with Bart earlier today with it, and it sounded pretty good to me. I said we did two tweaks, I also swapped out Piezo for Audio Hijack Pro to do the Skype recording. Both apps are from Rogue Amoeba, and while Piezo has served me just fine, since I own Audio Hijack Pro and it can actually record an uncompressed file, I thought I’d change things up and hopefully Skype will be a bit cleaner. This one was definitely not fixing a noticeable problem but since things were working well I figured I should change things up! Let me know if you notice a change, good OR bad! About a year ago Karl Beck wrote in our Google Plus community asking me why the NosillaCast wasn’t in Stitcher Radio. I explained that their policies didn’t line up with my philosophies, and even though I’d queried them to see if we could reach an agreement, they ignored my questions. Over the last year I’ve gotten a fair number of you asking for the NosillaCast to be in Stitcher Radio so when the CEO was on stage at the New Media Expo, I harassed him about their lack of response to my licensing questions. I went over this on a recent show but wanted to give a recap in case you’ve missed it. The good news is he got them to respond, and I liked their answer – specifically that if they did any remixing, reposting of my content, they would give me attribution. I do all this for free and all I ask is to get credit for the work I do! Anyway, the great news is that as of this week you can now find the NosillaCastaways on Stitcher Radio, or follow the link in the shownotes to add it. Now that the NosillaCast is in Stitcher, if one of the many people asked for this wants to do a review to tell us why Stitcher is so cool I’d love to hear it! I wanted to start this week with a short listener contribution. Terry Austin had a question on how to do something in Clarify so we jumped on Skype to see what was going on. We figured out the solution in just a few moments but kept yakking away. He mentioned an app he’d found and written a blog post about that sounded pretty cool, so I encouraged him to do a quick review for us. Hi there Allison and my fellow NosillaCastaways. It’s Terry Austin back here again. Today I’ll be helping solve a problem you may not even realize you have. Some of you may recall that I’m a professor in my day job. I am ALWAYS on the lookout for ways to help my students study more effectively. Last week I had a few minutes before class so I directed my students over to my site to a recent blog post of mine about a seriously cool workflow which convert pages of paper into audiobooks. I’ll give you the short version here and I’ll ask Allison to put a link to that blog post in the show notes for you. 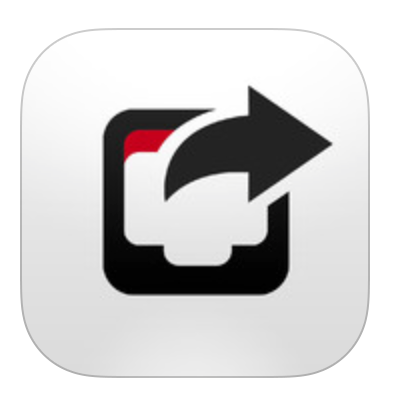 Two iPhone apps help us out with this workflow. First we need Scan+ from Smile Software in order to scan and OCR the text. Yes, it actually does excellent OCR on the phone. It also has the option to copy that text to the clipboard which is how we’ll hand it off to the second app in our workflow. That second app is Voice Dream Reader from Voice Dream. This choice little beauty is nothing short of amazing. Not only can it grab text from the clipboard, it can also browse through your dropbox folder, or Google Drive, Instapaper, Evernote, Pocket, Bookshare, even grab free eText from the Gutenberg project. You can use the default voice which is very nice, or listen to in-app purchase alternate voices. When Terry told me about this I decided to give it a try. There’s a free trial version of Voice Dream Reader called Voice Dream Reader Lite that has a couple of voices and some limitations but it lets you get a feel for it yourself. I don’t have Scan+ from Smile, but I did a review a while back of a similar app called Prizmo from Creaceed that does OCR. I took a quick scan with Prizmo which did the Optical Character Recognition (or OCR) for me, and I piped that right into Voice Dream Reader light and it immediately read it back to me beautifully. I then asked Terry how this was different from the built in text to speech capabilities of iOS. We gave it a try and the voice was so very mechanical compared to the one in Voice Dream Reader. I think one of the most powerful features of Voice Dream Reader is the integration with Pocket (the app formerly known as Read it Later) that Terry mentioned – so if you’re handed something to read but you have to be on the move, you can have VoiceDream read it to you in a lovely voice at a later time. I don’t want to steal Terry’s thunder by talking about any other features, so if you’re interested in all that Voice Dream Reader can do, head over to Terry’s blog at IntelligentElectrons.com and check it out. Dr. Bott is a company that resells products for other companies, and for some unknown reason they decided to mail me a giant box of goodies! I’m not going to review everything they sent me because if something isn’t good, I’m not going to tell you about it. I think there will be a lot of fun things in here though, some of them maybe worthy of a few words, some worth a longer review. Let’s dig into the box! I think it’s fun to use different iPhone cases – like my friend Niraj bought a set of 5 colors (real cheap ones) and used them to accessorize by his mood changing them out every day! I tend to be a bit more stable than that and I do have some requirements for my cases. They have to have a lip that comes above the surface – I think that’s important for minor accidental drops, they have to have easy access to the ports on the bottom, and I have to able able to get the case on and off easily. I’ve been using an Apple Project Red case, the leather (or is it leatherette?) one that came out with the iPhone 5s. It’s a cool color and meets most of my requirements, but it’s not the easiest to take on and off. My big complaint is that it shows grime on the corners something fierce, and I haven’t been able to find any way to clean it. In fact, the cleaning products I’ve used actually remove the red! In the goodie box from Dr. Bott I found a case from a company called Skech. Turns out Skech makes a ZILLION cases for all kinds of products – there’s 226 of them listed at drbott.com! The one I got is called the Rise for iPhone 5/5s (they make them for other iPhone models too) and it’s a gorgeous deep purple on the top 2/3rds, fading to black on the bottom. It comes up above the edge of the phone nicely, it has easy access to the ports on the bottom and it slides apart really easily. One problem with slide cases is that you can actually scratch your phone, but Skech includes a soft felt lining on the inside so that’s not a concern. The case itself is that super cool sort of soft rubbery feel that’s so popular these days. I LOVE this new case and will definitely be using it. It’s $24.95 over at DrBott.com. You MAY have heard me say from time to time that I’m just a smidge picky about my car. You can imagine that I don’t like sticking stuff to it or in any way changing the way it was meant to look. Because of that, I’ve never used any kind of car mount for my phone. They’re always kludgy looking, they leave a permanent fixture that’s awful to remove, and I could never get myself to even consider them. I do have a nice in car navigation system, so I don’t need my iPhone to act as navigation as often as most. However, Apple and Google maps have gotten really good, and in a lot of cases are an easier way to navigate than my fancy pants car system. For example, in Apple Maps, I can type in Nancy and it finds her house for me, my car can’t do that unless I teach it first where she lives. I’ve also started, just baby steps here, to use my iPhone for podcasts instead of my iPod Nano. I love Downcast on my iPad, but carrying the phone around when walking or jogging was a pain until I got the Spibelt I told you about last week. I also made a video for Sarah Lane on iPad Today showing how to actually get the audio from Apple Maps to come out of your Bluetooth stereo in the car, so I can do that now too. All of this points to more use of the iPhone in the car, but I have no way to safely glance at it. I’m always shoving it in a cup holder or putting it in my lap, all of which is not a safe way to go. In my goodie box from Dr. Bott I found the Airframe Portable Car Mount from KenuVision. I was skeptical that this would even be an option for me but I decided I might as well check it out. The Airframe is a very simple device with a spring jaw with rubber around it that allows you to hold pretty much any phone in most cases. The jaws open to 2.75″ wide, well more than the diminutive iPhone requires, so they say it will hold the Samsung Galaxy line, Windows phones and it sure looks like it would to me. The cool part is on the back. All it has on the back is a conical rubber piece that’s sort of like 4 flippers touching each other. You simply slide those over the blades in one of your vents on your dash. 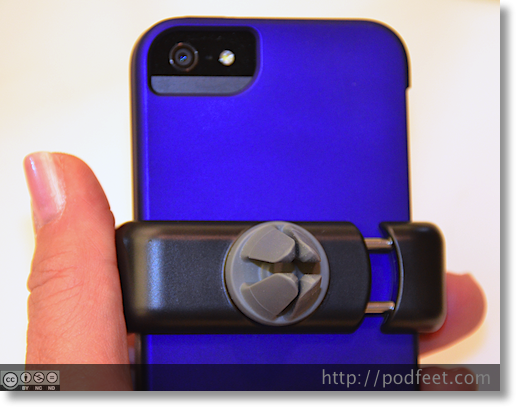 The little flippers grip snugly, not allowing your phone to wobble at all, but also trivially easy to slide right out. I’m in love with the Airframe. I can see me keeping this in my center console for easy access because it’s so easy to put on and off. No goop to stick to your phone or your car, just easy clean lines. Perfect option. I put a video in the shownotes from the KenuVision site so you can see how easy it is to use (if my perfect description of “flippers” didn’t work for you.) I started using the Airframe over the weekend and I think it’s going to be a standard tool for me from now on. The only complaint I can think of is that it doesn’t allow you to adjust the blades of the vents as easily because their travel is limited now, but I think I can live with that for the advantages. The KenuVision Airframe Portable Car Mount is $24.95. I put a link in the shownotes to the Airframe on the Dr. Bott site which is where I’d prefer you buy it, but right now it says out of stock so if you have to have it right away I put an Amazon link in the shownotes as well. Greetings fellow NosillaCastaways, Kirschen Seah from FreeRangeCoder.com with a review of an iOS app which solves a problem with my e-mail. Now, what’s that problem to be solved? Well, I have more than one e-mail account – don’t we all – and I’ve been using the iOS Mail app to read messages. Thank goodness for its combined inbox! So, what might the problem be? Here it is – I get quite a bit of e-mail in all my accounts, and what’s more there’s bacon, that’s self inflicted spam mail – you know, those you get from online stores, magazine subscriptions, and I wanted to very quickly go through and remove messages which I don’t need or want to read. I could turn on the Edit mode in the Mail app and select the messages to delete, but that would mean a second pass through the messages to see what needs to be filed and actioned. So here’s where Dispatch comes into my e-mail workflow. Guess which I have set my Quick Action to? Why, delete of course! And now, with one quick long swipe to the left on the message, voila, it gets trashed! And if you accidentally delete a message, a helpful big red Undo button appears at the top. Saved me on more than one occasion! Dispatch has a little button bar on the bottom – tap on the lines icon on the left to select all messages in the inboxes, both read and unread, tap on the circle icon in the middle to select only unread messages, and tap on the star icon on the right to select starred messages. But wait, there’s more – Dispatch also includes a snippet expansion capability, independent of what iOS provides. And moreover, Dispatch interfaces with my favourite snippet expansion program, TextExpander. And that’s not all – Dispatch connects with popular iOS apps such as OmniFocus, Drafts, Reminders, Calendar, Fantastical, Things, Clear, Message, 1Password, Instapaper, the Phone app and more! Now I can quickly create tasks, calendar items, save an article link for future reading, or even send a text message or call a phone number in the e-mail. Dispatch also lets you reply to the e-mail message and it’s clever enough to put in the first name of the message’s sender, taken from the sender’s e-mail address or from your Contacts. And you can customise that greeting too! So, how does Dispatch figure out what your e-mail accounts are? Unfortunately there’s no automatic extraction from your Mail app accounts, as they’re private to Apple. Yes, you have to enter the accounts one by one, fortunately it’s quite a painless task, as Dispatch figures out many of the settings automagically. There are a few small shortcomings for the app – I have noticed that it doesn’t mark the messages as read when I do a delete, and there’s no way at present to file a message when you’re reading it, which could be done in the message inbox list. Fortunately, the developers are responsive to support e-mails and I’m working with them to resolve the issues. And what’s more important, they’re from Singapore, where I’m from! If you’re looking for an iOS app to quickly run through your e-mail messages and (ahem) dispatch them, then look no further – Dispatch is for you. I love it so much, I’m running it in iPhone mode on my iPad. Now if only they sync’ed the settings between iOS devices… I can only hope (and ask the devs). Dispatch is available from the iOS App Store for US$4.99 and you can visit their home page (http://www.dispatchapp.net) for more information and some screenshots. 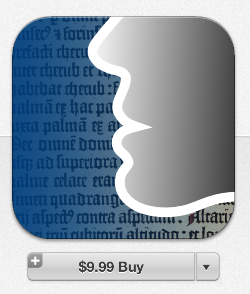 Might seem a little “pricey” for an iOS app but hey, it’ll pay for itself soon enough. This is Kirschen Seah of FreeRangeCoder.com, wishing you power over your e-mail with Dispatch. And I’ll see you in the bitstream. Last week I told you when I’d be speaking at Macworld, but I was sad that Katie Floyd and I would be talking opposite each other so I got the Macworld folks to move me so you can see both of us. Katie is on at 3pm on Thursday and I’ll be on at 4 right after her – double the fun! I have two cool pieces of news about Clarify this week – the first is that Clarify 2 is now in public beta! This means you can go bang on it and try to break it and send feedback to the folks at BlueMango Learning. I’ve been messing with it for a few weeks now and I have yet to be able to break it. I did find some things that didn’t work quite properly but Trevor got right on them and got them fixed so you’ll see a pretty darned polished product. You’ll get to play with numbered steps, sub steps, and more. I put a link in the shownotes to the public beta so head on over and see if you can break it. There are still two or three of you left who don’t own Clarify yet, so I have a deal that you can’t refuse. Well of course you could but I don’t think you’re going to want to. A company called Paddle is running a Mac bundle with a new twist. They have a whole pile of apps and you get to choose the 10 you want, all for $40, and Clarify is one of the options! Remember how much I liked Prizmo for iOS? Well the $50 Mac app is one you can add to your bundle. Here’s a useful utility I haven’t heard of before, it’s called Singlemizer which helps you get rid of duplicate files on your Mac for $20 – who hasn’t needed THAT from time to time? Here’s another one I haven’t heard of but could totally use – it’s called DropDMG – you can just drag a folder or file onto DropDMG and it creates a disk image for you. I followed the link to the developer page and found that you can even created encrypted disk images with DropDMG. It’s normally $24 all by itself, so throw Clarify, Prizmo, Singlemizer and DropDMG together and with just those four you’ve got $124 worth of software for $40 and you can pick 6 more! Ooh – I just noticed they have Snapheal which is a cool application for erasing annoying stuff from your photographs, like if Jeff Gamet photobombs you or something like that. I wrote to the Clarify folks and they verified that if you buy in this bundle you DO get the free upgrade to Clarify 2 when it comes out. Even if you’ve already bought Clarify, be like Big_in_VA and pick up another copy with the bundle from Paddle, and of course there’s a link in the shownotes!